Sankie & Jamie have been married since 1999. They have three boys, Sankie II, Owen, and Jackson. Eight years ago, they knew God was directing them to church planting. But what gift set does that require? What assessment is needed? What country? What city? What type of church? What type of church planting network would collaborate, care for, and walk them through? They began their lives together in a church plant in NW Arkansas. After three years, they thought they were going to spend their lives overseas, so they joined a missions-mobilizing group called The Traveling Team. God began to clarify calling and gifting over the next couple of years, and they knew shepherding/pastoring churches, making disciples, church planting, and further theological education was part of the future. 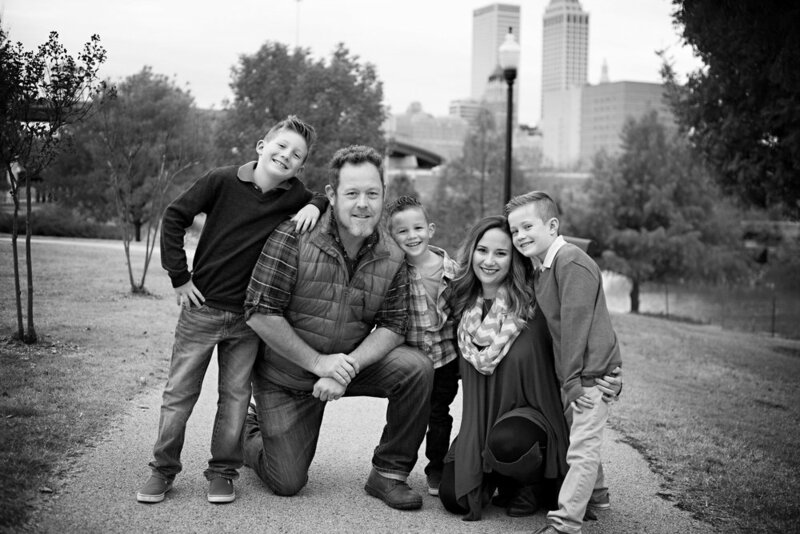 They spent ten years in Tahlequah as Sankie was on staff at Grace Baptist Church as the Pastor of Twentysomethings & Small Groups and then four years on staff in South Tulsa at New Beginnings as Pastor of Discipleship and Young Families. Five years ago, back in Tahlequah, they thought God was leading them to Louisville to finish his Masters of Divinity degree at Southern Seminary and join the church planting residency through Sojourn Network. Then pray and let God choose a city, and then be launched out. But God had a more beautiful plan, and brought them to Tulsa. Sojourn Church launched out in October of 2017. Tyler & Kaylie Mills (son Benjamin) moved here to join the plant and become the first actual resident for planting/missions back in June before they launched. The Elders and Mission Team of New Beginnings Church enthusiastically supports and launched the Lynch family, along with two other incredible couples, Tony & Katie Wallace (sons Clay and Jackson) and Dan & Renee Wall (daughters Arabella and Danelle), as their first church plant. Mercyview Church (an Acts 29 Church) sent out Matt & Cassy Pack (daughters Naomi, Nora, Audry) as well as much leadership vision and support. Dave & Lori Pentecost (sons Brandt and Reed) also joined the plant team.